Bill Hanshumaker: This is the food for Reuben’s last supper. This is called a red rock crab – cancer productus. It has a hard shell and very sharp claws. So the question is how can Reuben actually prey on this animal and not get hurt himself. A neurotoxin in their saliva paralyzes the crab so it won’t bite. I’m going to feed him. Now notice how he changed color? Look how pretty he got. Come on Reuben. Basically what I’m doing right now is getting him excited about it. They can actually taste with their suckers. It is a tug of war now. 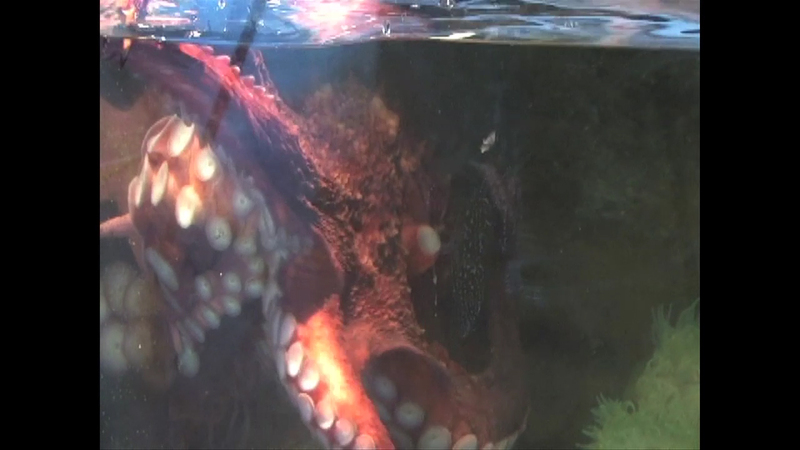 When the octopus eats it uses a hardened structure called a beak. This beak is in a muscle. The structure itself is very similar to fingernail. So it’s not bone, but it is very, very tough. The octopus uses this beak then to bite its prey, but functionally uses the salivary glands both as a place for the neurotoxin where it paralyzes the crab and for a place for enzymes that help dissolve the food inside of the crab’s shell. See how he billows out like a parachute, envelopes the crab and then he’ll bite it with his beak. There’s not one fiber of food left inside of this crab. Literally what the octopus does is turn the inside of this crab into a milkshake. He has an enzyme, which breaks down protein, which makes it soft. So after he paralyzes the crab he has to go and hold onto the crab for a certain period of time until the enzymes make the inside of the crab soft enough so he can lick out with his radula. You and I couldn’t clean crab as well as the octopus does.